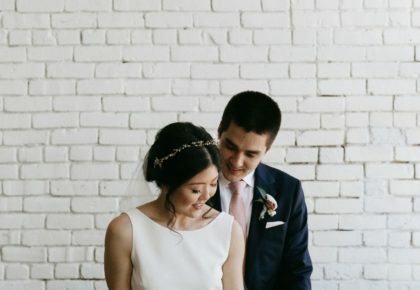 Scroll below to see a gorgeous suite by Ashley, photographed by Elizabeth Denny Photography at Trinity Hall, and read more about what inspires her. 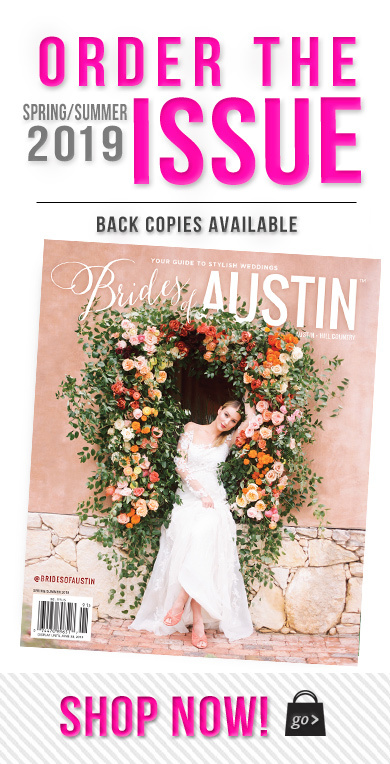 Stay tuned as we continue our series featuring more of Austin’s top invitation designers! 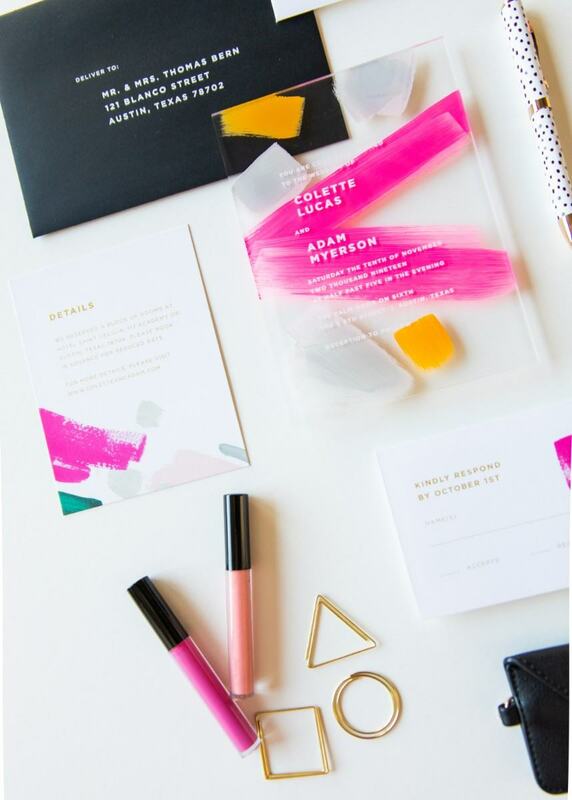 Tell us about this suite: This design is all about modern color! I love painting and wanted to bring in some hand-painted elements. 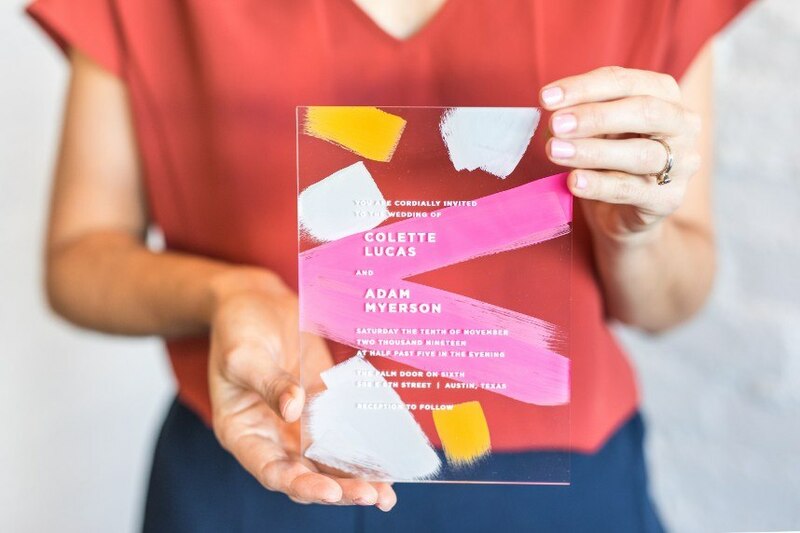 To create this design, the invitation wording is printed directly onto a clear acrylic piece. Afterward, I painted on the back of the clear acrylic for a really cool layered look. I then created matching reply and details cards on luxe cotton stock with a similar feel. 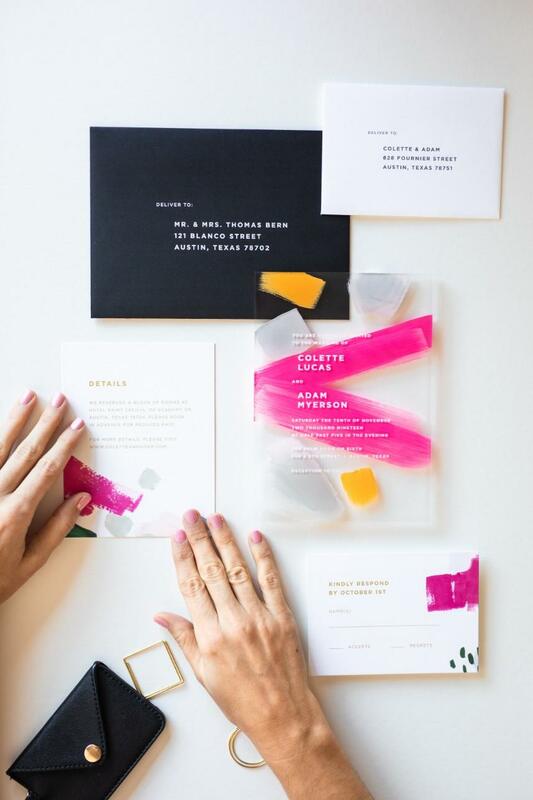 The black envelopes add an elegant finishing touch. 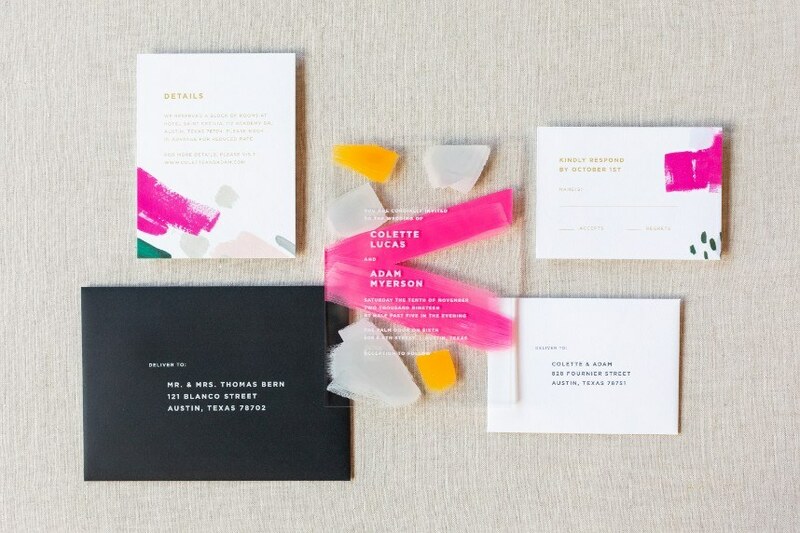 I picture this as the perfect invitation for a wedding at an art gallery or a chic modern loft. I wanted to explore different materials, and I love how the acrylic turned out! Adding the painted texture gives it another layer of dimension. With an invitation like this, there’s such a fun element of surprise. I can imagine guests receiving this in the mail and getting so excited! What inspired your company name and how did you get started in design? My mission from the start has been to create meaningful designs that make people happy. “Fine Day” came from this concept of optimism and happiness, and adding “Press” conveyed the idea we’re primarily in the business of making paper goods. 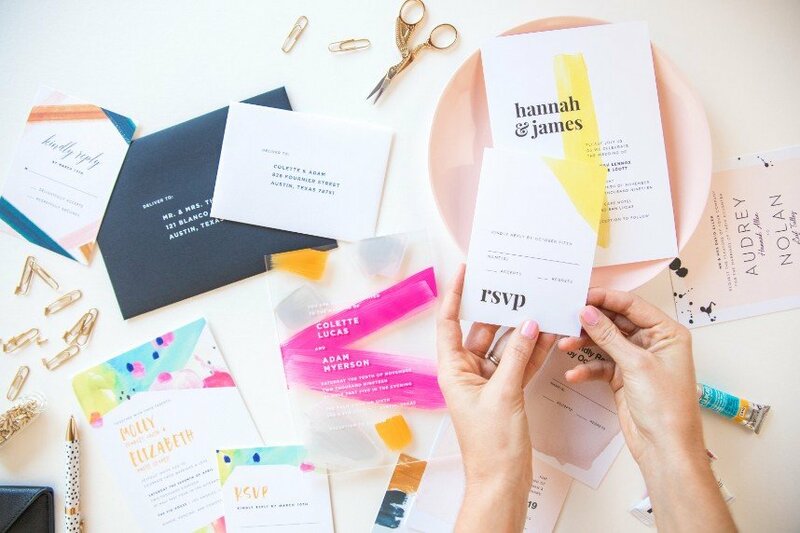 I started out creating invitations for friends early on in my graphic design career, and after my own wedding, decided to take the plunge and start my own line. I haven’t looked back since! What inspires you and sets you apart? Color, texture and typography – my three favorite elements to play with! I’m inspired by textile design, abstract expressionism, mid-century modern style and natural materials like greenery and florals. 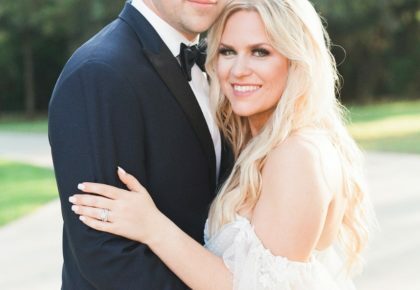 The couples I work with inspire me as well – when a couple has an idea about creating something custom, I love exploring new directions and pushing the boundaries. I have a passion for painting and artistic details, and I think that really comes through in our design collection. Touches of hand-done watercolor backgrounds or brushstrokes add a special touch to the final pieces. I’ve spent a lot of time finding the best paper and printing methods to highlight our designs so that the invitation looks and feels amazing! Which trends are you loving right now? I love some of the color trends happening right now – I’m seeing a lot of rose, rust, ochre and dark peacock shades that feel really luxe and different from the standard tones. 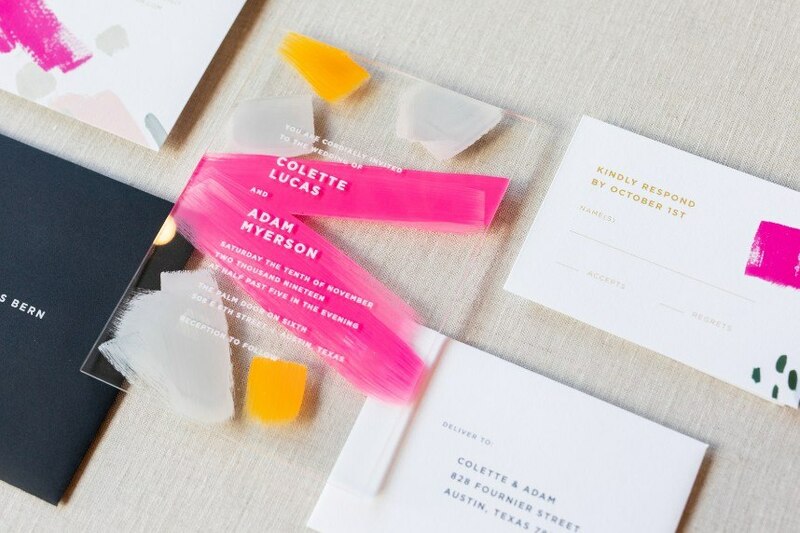 I also really love the modern, minimal invitation trend that’s all about beautiful typography on gorgeous paper stock. 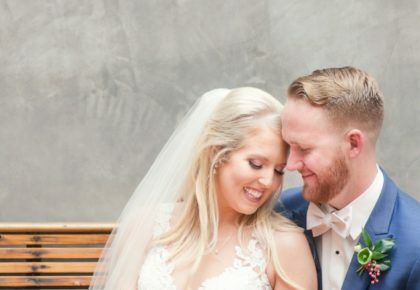 Ashley says there’s no better feeling than when a bride sends her a note to say the guests are loving the invitations. Making her couples happy and making an impression on guests are what Fine Day Press is all about. Cheers!